I'll will be Speaking at V3con Panel: Social media's impact on mainstream media and blogging at V3con: Digital Media Conference August 25 - Japanese American National Museum. Is social media the future of news? More and more people are getting their news from social media — on their mobile devices. Journalists are finding that social media can be a valuable tool for research. Social media’s immediacy drive the immediacy of news, but raise the hazard of inaccuracy. How are journalists and bloggers adapting to the new reality? 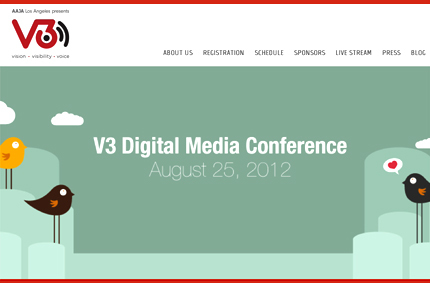 The V3 Digital Media Conference (V3con) will highlight and expand multi-platform Asian American and Pacific Islander (AAPI) communications by gathering thought-provoking AAPI online journalists, creative social media communicators, seasoned bloggers and those interested in engaging on digital platforms. In this unique, one-day conference setting, all are invited to share their experiences, knowledge, endeavors, and visions with others during interactive panels and workshops.